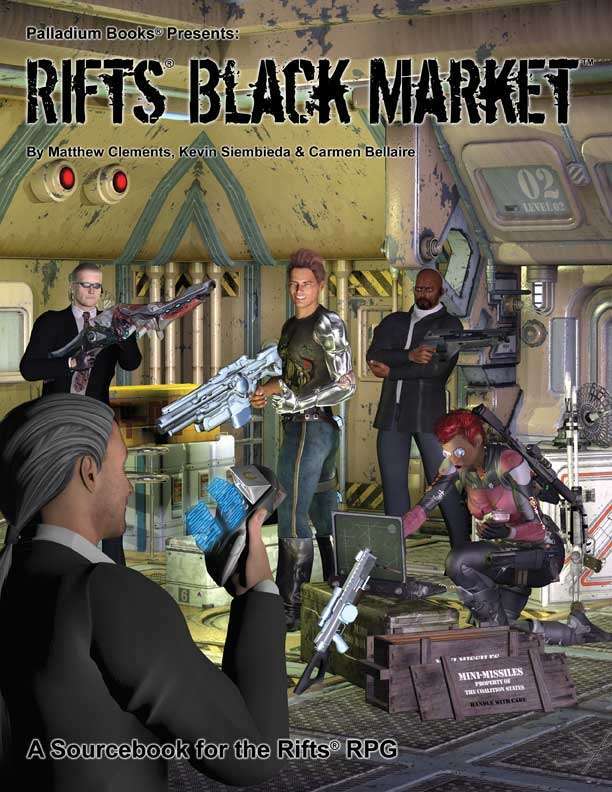 Rifts® Black Market™ is an epic, 192 page sourcebook that contains a wealth of information about the inner workings of the Black Market, the Five Factions, new Bandito Arms/Black Market weapons and gear, how to make any O.C.C. a Black Marketeer, special abilities of the Black Marketeer, criminal enterprises, Black Market loans, merc and crime jobs, and much more. This book has it all. AND best of all, a lot of it can be easily adapted to just about any world setting, not just Rifts Earth. New Bandito Arms weapons, power armor and robot riding animals. New BigBore weapons and other weapons and gear. Black Market Techno-Wizard weapons and items. Any O.C.C. (or R.C.C.) can become a Black Marketeer. 10 Specialized O.C.C.s of the Black Market including Con Artist, Enforcer, Expediter and Rift Runner. The Five Black Market Factions that wield the greatest power in North America: Bandito Arms, The Chicago Network, The Immaterial Hand, El Oculta and Le Marche Noir. Criminal enterprises and inner workings of the Black Market. Traveling Shows: Freak Shows, Medicine Shows, Circuses and more. 192 pages written by Matthew Clements, Kevin Siembieda and Carmen Bellaire. Additional material by Taylor White, Julius Rosenstein and Alex Marciniszyn.